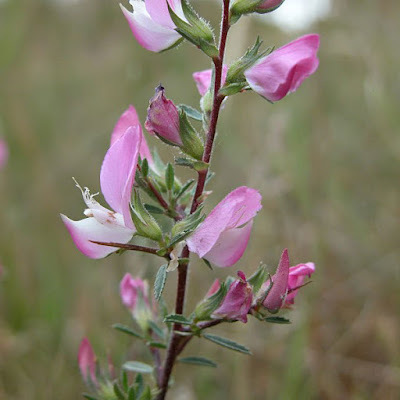 Spiny Restharrow (Onosis spinosa) is an ancient medicinal plant used in the time of old Greeks and Romans to treat kidney stones, rheumatism and gout. This perennial herbaceous plant grows in Europe, Asia, and Africa, and mostly finds in meadows, pastures, at elevated altitudes, along the perimeter of the forest. It likes dry terrain, without much moisture. The plant is in the form of a lower bush with stems that are solid and branched with thorny shoots. On the stems in the lower part of the plant are leaves that are made up of three parts, while in the tops, the leaves are one-piece. The flowers are on thorny shoots and are usually pink to dark red. The root of Spiny Restharrow is branched, long and goes deep into the ground. What are the Medicinal Parts of the Plant? Medicinal part of Spiny Restharrow is root, although leaves and flowers are also medicinal. The root is used in a dried condition for the preparation of tea, tincture, and other medicinal preparations from Spiny Restharrow. The plant flourishes from May to September, and then the leaves and flowers are collected. The root is removed from the soil in the spring or autumn, because the root is the healing part of the plant. After leaving the soil, the root is well cleaned from the ground, washed under water, and laid on the ground to be dried in the strong sun. After drying, the root can be cut into smaller pieces and packed for further use. What is the Chemical Composition of Spiny Restharrow? 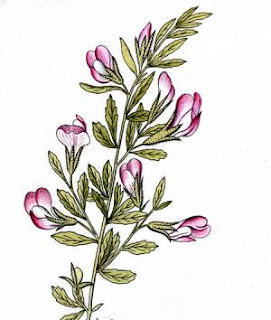 At the root of Spiny Restharrow there are medicinal substances such as glycosides - ononine and onospine, sterols, tannins, essential oils, starch, resin, terpenes. What are Health Benefits of Spiny Restharrow? This herb is not recommended for people who have edema as a result of a weakened kidney or heart function. Pour teaspoon of dried root of Spiny Restharrow with 200 ml of water (cold water) and put it on the heat to briefly boil. After that, leave the tea covered to stand for 15 minutes, then strain. Drink the cup of tea 3 times a day. Place in the glass bowl (jar or bottle) to half the dried root of the plant and pour with 200 ml of medicinal alcohol. Close the container and leave it on to stand in the sun for 3 weeks. After that, the contents are processed. With this alcoholic solution, clean the face with pimples and acne. Take a teaspoon of dried root of the plant and pour it with 250 ml of apple cider vinegar and gently warm for about 15 minutes, without the boiling. After that, leave solution to cool and rinsed mouth with this lukewarm solution.